Page 69 of Romeo and Juliet as it was when the volume came back to the Bodleian in 1905. The first week is over, and we have now worked through the entire volume turning over obscured text, and noting all the splint repairs that we feel need to be done in order to turn the pages without causing further damage. We are confident that we have enough time next week to complete these repairs, so that we can move to the digitization phase of the project on schedule. We have been amazed at the physical observations that we have made as we go through the volume. The paper is in places extremely thin and often of second grade quality, with creases, pleats and papermaker’s flaws visible throughout. This has made the leaves particularly vulnerable to heavy use, and in many places the whole lower corner of the leaf has torn or broken away, one can almost imagine, in someone’s fingers. The same page today. Despite the extreme fragility of this leaf, the condition has not deteriorated. 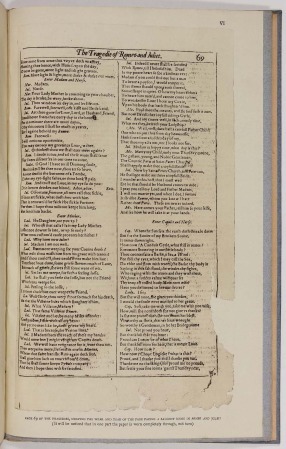 We have an excellent image of the condition of page 69 of Romeo and Juliet in The Original Bodleian Copy of the First Folio of Shakespeare (The Turbott Shakespeare). Incredibly, it appears that the leaf is now, after 107 years, in identical condition, including the crumpled edge and extent of the tears. It is fascinating to us, as conservators tasked with protecting the Libraries’ collections that although extreme damage was caused to the paper of the textblock during the first 40 years of its existence, the most serious damage caused in the more recent years (since 1905) has been to the attachment of the upper board, while the state of the paper seems to have remained constant. A strong reminder to us all of the importance of careful book handling and the use of suitable book supports when working with our Special Collections! 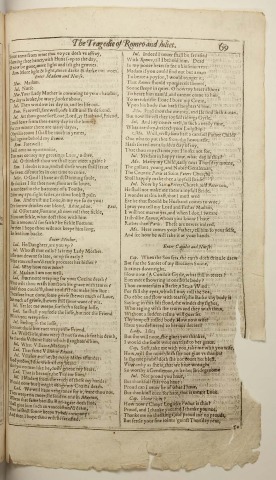 This entry was posted in conservation, printing, production, project, rare books, Sprint for Shakespeare and tagged book history, book production, conservation, rare books by Sarah Barkla. Bookmark the permalink.